You walk in through the cavernous foyer, conscious of the sound of your footsteps and the echo they make. The door, with the number 19 lettered across it, is open. Looking in down a short corridor, there are exposed concrete walls and a sign with crooked lettering. You walk down the corridor and are steered to the right, into a darkened room. Everything is an unidentifiable black until the screen comes on. It is almost the whole of one wall but not quite. It is a blinding square of white. THIS IS BARBARA CLEVELAND is a new short film produced by the Brown Council, screened at Sydney’s Carriageworks as part of the YOU’RE HISTORY festival. Barbara Cleveland will be an unfamiliar name to most audiences, as the film was made for the express purpose of lifting Cleveland out of the mists of time. A prolific member of Sydney’s performance art scene in the 1970s, Cleveland disappeared in India in 1981. The Brown Council film was inspired by their 2011 discovery of a small archive box containing the last few remnants of Cleveland’s once significant body of work- several photos of the artist that do not show her face and her type-written “lecture notes” which read like a fragmentary collection of stage directions for one of her performance pieces. What does it mean for Cleveland’s work to be re-enacted and recorded? The Brown Council admit that Cleveland did not want recordings of her work to be made for fear that to do so would detract from the performance itself, yet they seem strangely indifferent to the consequences of their film. It is important, to them, that a pioneering feminist performance artist not be excluded from the discourse of art history. Not content to pay homage to her work and legacy, the film mythologises Cleveland, portraying her as an enigma- an artist who is also a mystery to be solved. Did Cleveland disappear intentionally? What does it mean to write about her, to put her back into the art history books, to imitate, as the Brown Council do, fragments of her artworks? The film’s narration is intercut with footage of a woman, dressed as Cleveland was in the few photographs found in the archive: blue jeans, white t-shirt, long brown hair, hidden face. 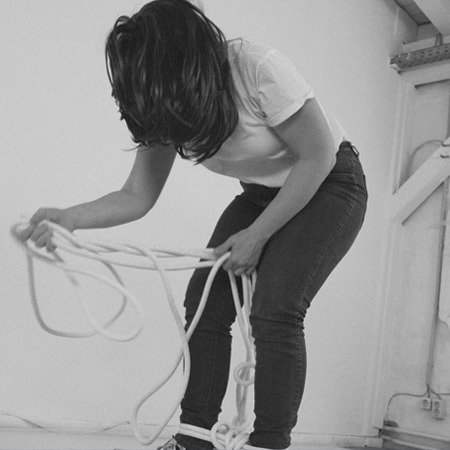 This woman ties a rope around her waist and stretches it across the screen in homage to Cleveland’s piece where, with a rope tied around her naked body, she blocked traffic across the Sydney Harbour Bridge. The woman in the film puts a dunce cap on her head and faces the wall; the Brown Council later tell us that this was one of Cleveland’s most confronting works, where she occupied a corner of a gallery, again naked and with a dunce cap on her head, refusing to engage with her confused audience. The woman rubs her naked body and growls, reliving Cleveland’s explorations into the animal self. THIS IS BARBARA CLEVELAND has questions it cannot possibly answer. It prompts the viewer to wonder why Cleveland disappeared, and why it is so important that she not be allowed to do so. If, as the Brown Council says, it was important to Cleveland that her work existed in the performance itself for the benefit of those present to witness it, it is hard to understand why the collective insist upon examining her work through film rather than through a performance piece. In committing Barbara Cleveland to film, they are inexorably altering her work, and insistently binding the woman, the myth, and the art together so that one cannot be examined without the other. This entry was posted in Arts and tagged art, barbara cleveland, brown council, carriageworks, performance art, sydney. Bookmark the permalink.